Creative worship in the form of visual art creation has been a goal I’ve focused on for the last seven years or so, since I began keeping a visual journal of drawings spontaneously sketched to capture the message being communicated within sermons. This Easter, during the Good Friday worship service, that dream of expressing devotion through the talents God invested in me and conviction the Holy Spirit presses on me came to life in a divinely orchestrated project, The Triumphant Cross. The service was arranged into three sections, an opening worship set, delivering the message, then a closing worship set. With careful coordination with the music selection and words of the sermon, the painting evolved throughout the service while I was physically working during the worship music sets that bookend the sermon. The image traveled through four different stages, capturing four different messages on its way to final completion. The starting point of the artwork was a stark white panel. White represents purity and innocence, this is the beginning of existence. Standing at the front of the stage, illuminated by spotlights and the thunder of the drum set, the bright presence of the panel on the easel is unavoidable. The panel stands unmoved, silently shouting “I am here, I am part of this”. Meditating on an image to capture the depth and meaning of Jesus’s traumatic sacrifice on Good Friday, the pain of loss and confusion of burial in a sealed grave during silent Saturday, to the flood of joy and victory on Resurrection Sunday, my spirit was led to focus on the secure hope delivered to us through it all. One of the most secure and reassuring phrases uttered by God throughout the Bible to me is the simple statement of ‘I am’. Those two simple words are a statement of historical fact, present status, and future intent. God was, is, and is to come. This pure white panel simply states, I am. As the first worship set begins, the white panel comes to life in an array of bright colors. The worship team begins the set with King of My Heart, which is an anthem of hope and security of our life and our worth in Christ. I specifically chose the brightest oil pastels I could find to create a feeling of the work exploding to life. Large, geometrical shapes of colors familiar to Easter and the beginning of spring formed an image styled similarly to a traditional stained-glass window. The focal point of this drawing took shape of a ‘Christmas Star’. I wanted this shape to take viewer’s minds back to the beginning of Jesus’s life, His humble and beautiful birth and the excitement of realized anticipation of a new king arriving. Full of energy and color, Jesus is alive. King of My Heart transitioned into No Longer Slaves with a short chorus of ‘God is so Good’. As we sang of rescue and deliverance from fear, I added two small, yellow crosses in the bottom corners of the panel. These crosses rested on two green hills, then a purple hill was added at the base of the star. At this point, I began shading the edges of the star with a drab green-grey. The bland hue fights against the brightness of color used to this point. As I contaminate the image with darker shadows, the star is re-formed into a cross. The life and energy of the star that dominated the artwork draws back into a symbol of suffering and death, arms overreaching the crosses below where the guilty hung. Life and energy are now mingling with guilt and fear. At this point, I pick up my paintbrush. None of the original white remains, the purity has been compromised by a mess of color that pushes and pulls against itself. Reckless Love has been a pivotal song for this Easter season at Journey Church, for our congregation and within our worship team. As my brush travels around the panel, the colorful depiction of the cross is slowly picture-framed by heavy black. Directing my strokes to make the blackness grow, the dark closes in on the cross. Soon, the main cross in the center is the only shape remaining. As the song leads into the bridge, I fill in rest of the image with intensity until all that remains is solid black. Everything that was once white and pure is now completely opposite, black and heavy. The life and energy that this image contained has died and is now buried. The panel is left at this stage while our lead pastor comes to stage and delivers the sermon he prepared. My intent was for the congregation to be left wondering at this point, confused why I would have “ruined” the colorful image I had worked so hard to create by painting it entirely black. I imagine that feeling may come close to the emotion the disciples felt as Jesus was led away by the Roman soldiers. The shock and despair of the hope found in doing life with Jesus, stripped from their foundation by the betrayal of one close to them. Then the anxiety of wondering what is coming next. As Michael closes the sermon and invites the congregation to respond, I return to the easel with the worship team on stage. The second worship set kicks off with When You Walk Into the Room and includes worship through communion. I begin working on the next phase of the artwork with as the song begins. As we sing these words, I use a knife to cut away the dark paint that buried the bright color. Life is returning with each stroke. I chose to carve blooming flowers out of the blackness. I studied several species of flowers and their traditional meanings while settling on the designs to reference, right up until the moments before I walked back on the stage. The focal point and largest of the flowers I chose is the open bloom of the Edelweiss. The edelweiss flower represents courage and devotion, two of the most predominant characteristics exemplified by Jesus as He laid Himself down without guilt and with the power to free Himself from the entire process. At the moment of Jesus’s death, the veil which separated the majority of humanity from entering the presence of God was torn from top to bottom. This symbolized the destruction of the wall separating us and opened the pathway for everyone to communicated with God on a personal and individual level. O Praise the Name was the song chosen to finish out our worship for this night and the grand finale for this painting. As a nod back to the tearing of the veil, I dropped the knife and began tearing away a shape I had created with tape and concealed with a last coat of primer. As I continued to peel off the tape, a historic icon takes shape. The circle represents the globe, while the horizontal line symbolizes the equator. The cross rests in the center of the circle, acting as the axis which the world turns on. All of the colors and contamination are now removed. The innocence and purity are dominant again, standing out brighter than anything else in the image. The cross was present from the very beginning, designed into the perfection of ‘I am.’ We just couldn’t see it until we were on the other side. Life is War. To Pray is to Fight. After a long drought brought on by life, I have finally let myself open up and create spontaneously again. We kicked off a new summer series yesterday morning. For the next few weeks, we’ll be focusing on prayer, how to pray, the importance of prayer and what our focus should be. Life is war. Spiritually, emotionally, physically; we are constantly battling something. Some days we battle ourselves. I chose the image of a boxer to embody the idea of prayer being our fight. 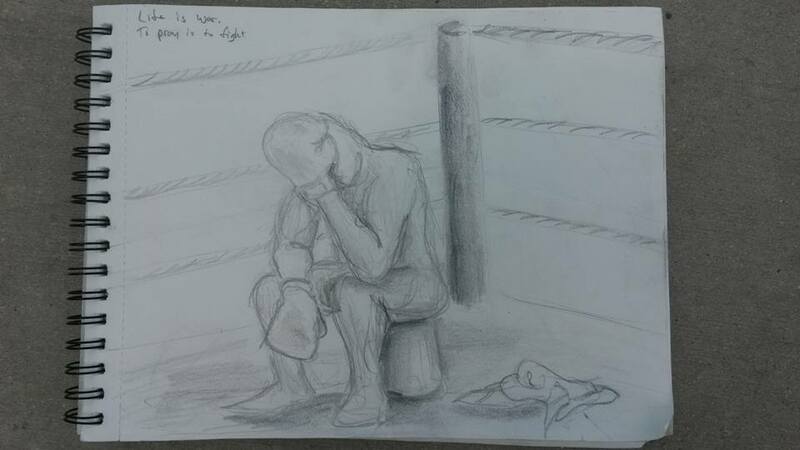 The boxer is exhausted, resting in his corner, his sagging head only held off the mat by his arm. His towel lay crumpled beside him. The boxer is ready to fire the towel into the ring, giving up on all that he has worked for, but he lacks the arm strength to throw. Burying his face in his glove, all he has left is to pray. Prayer is all the fighter has left in his arsenal. Often times, we get to this point where crying to God is all we have. Through our fatigue, we feel inadequate to pray and lack the confidence to even know what to say. Prayer is not about your words, it is about your heart. Learn more about how to pray here. God doesn’t need your words, he needs your heart. He needs your mind to open. Choosing the image of the boxer is a personal reference for me as well. I have been travelling through an expanse of parched land in my life. The ground burned by neglect and the consequences of good intentions. Physical exertion has been my release. As I drew this image, I was reminded of my own fight by the dull crimson scars on my knuckles. Fresh wounds beginning to heal. Memories of another round violent encounter with the heavy bag. Life is war. We must remember we are all in this together. All of us. In this week of Advent, we focus on our responsibility in changing our own lives. Our heart is the singular director of our motives, our decisions, our lives. In order to change your life, you must first address your heart. These words slide easily off the tongue or over a keyboard, but enforcing them within yourself is exponentially more difficult. We are colorful creations, broken under the weight of our own obstinacy and insecurity. We enter this world as pristine glass sculptures. Physically imperfect, but entirely transparent and pure creatures. Every interaction, from encounters with other frail creations to inanimate obstacles either polish our sheen or leave cracks in our carapace. As life progresses, the spider-like feelers continue to fracture from the epicenter of every crack. Before long, our cracks become breaks and we lose shards of our innocent encasement. Society teaches us to concentrate the core of our energy on piecing these shards back together in a pristine cloak, a never-ending endeavor that leaves us frustrated and filled with regret. God has a different plan. Today’s piece is designed to be read from background to foreground the recess into a mid-ground layer. The background is dark and chaotic, a seeming explosion of blacks and blues. The torso stretches itself from bottom to top, gaining every bit of height its muscles can maintain. The base of this torso is orange, the opposite color of the blue background. The soul of this torso rejects the dark influences around them. It is through the jaggedness of our fragile and shattered selves that the light of Gospel endeavors to shine. Each crack, every pointed shard, refracts the light further and breaks the love we show the world into a full spectrum of the Gospel like a prism. 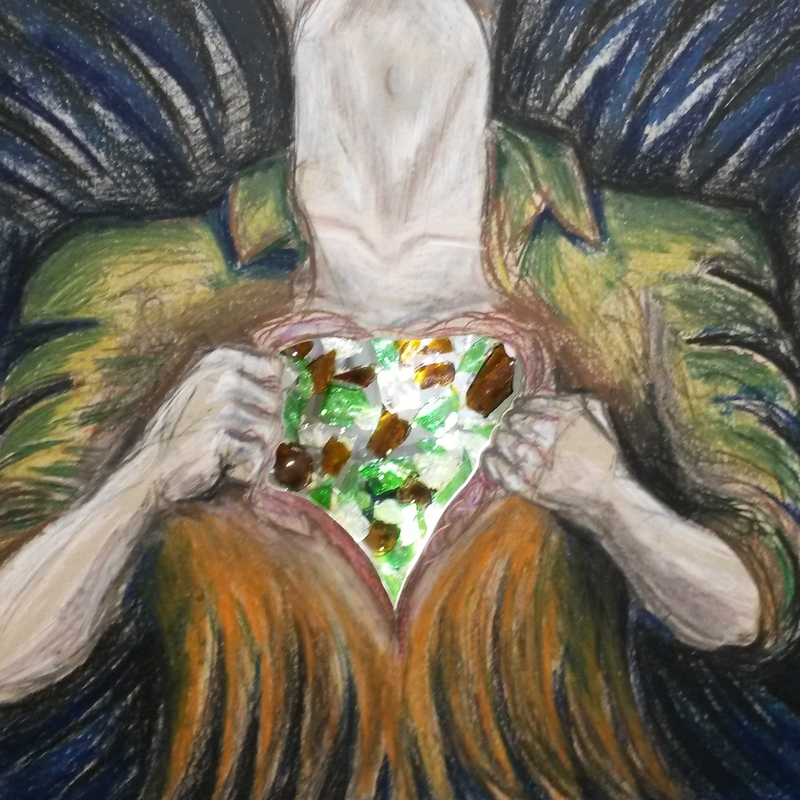 Open your heart to loving the world and all the shattered sculptures moving around us. Let them see your courage to live boldly open in spite of your imperfections. With a strenuous, sustained pull in both directions, the torso opens itself to bear its soul to the world in all its imperfections. This act of complete exposure leaves this individual vulnerable to conjecture from the rest of us while simultaneously raising itself above all others. The heart-shaped hole being ripped through this chest exposes a beautiful mosaic of color as a single light illuminates every plane of shattered glass once moulded in this unified body. The irony being, exposing this shrapnel of wrong turns reunites every scrap like a jigsaw puzzle, reassembling itself into a being more beautiful than the original. An act that refuses to go unnoticed and inspires others to open themselves in a beautiful butterfly effect of self discovery. If you will change your heart, demoting yourself to a servant of all, you will change your life to become the hero for many. My, it’s been way too long since I’ve shared an update here. Family, friends, work, and play have all taken precedence over blogging, and rightfully so. We’re half way through the classroom side of Pharmacy school and the kids and I are having a blast being boys. In riding the roller coaster that this chapter of our lives, art has not taken a back seat, but the blog roll has! I am excited to announce a new series that will roll our next week. I will be creating a painting for each Sunday of the Advent season this year, to be displayed during the vocal message with which the image correlates. I am insanely excited to share with you the first installment, “Dark to Light”; but I must control myself to not let the cat out of the bag too early! This piece will be like none I’ve created before and I know it will blow you away the same way it did me creating it. Stay close! Next Sunday, ‘Dark to Light’ will be unveiled! Every creative thrives on feedback.We are inspirational people who make a difference through art. The fire of our passion is fanned by minds reacting to our work. 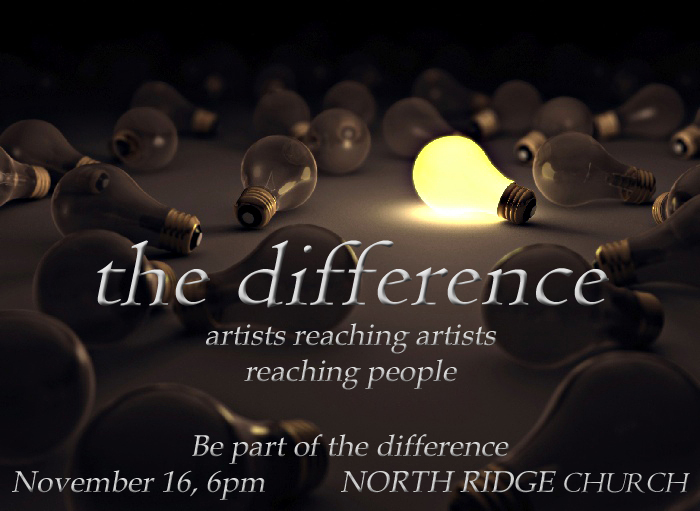 Together through ‘the difference’, artists will meet to engage, mentor and inspire each other. Our different styles, media, methods, and perspectives is our strength. Together, we will unite into a culture-steering force impacting our community with creativity. Join us for a night of art and conversation.